Some inventions are so innovative and well thought out that you simply can’t imagine life without them. Somebody had to invent the wheel after all. While theFlygrip isn’t quite as groundbreaking, I can’t imagine using my iPhone without it. While attached the Flygrip adds minimal bulk to the back of the case and can be used as a horizontal or vertical stand for your iPhone–perfect for those tiny airplane tray tables or really any situations in which you want an easy viewing angle. The killer feature of the Flygrip is the ability to hold your phone with one hand when the Flygrip is extended. 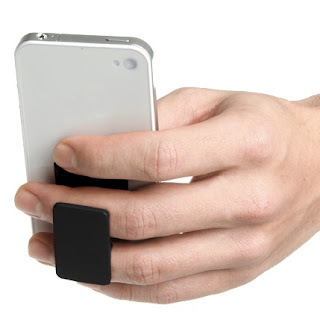 Instead of using a “death grip” to hold your phone, you easily mount your iPhone between your fingers and wear it like you would a ring. These leaves all your fingers free to text or swipe. A few minutes of using this in mass transit and I was hooked on the Flygrip. Holding my phone with my hand instead of between my fingers seems so 20th century now. With all the advances of the iPhone, we still hold our phones just like we did 100 years ago. Join the 21st century and get yourself a Flygrip. One caveat about the Flygrip. While I absolutely love it, the adhesive had trouble with extremely cold weather. A subzero Kansas winter caused my first Flygrip to detach, so be careful with weather extremes. Additionally, the adhesives didn’t work well on a soft shell bumper cases or any case with significant texture. It needs a solid flat and clean surface to adhere, leaving some cases unable to work with the Flygrip.